The prospects of today’s younger generation is a topic that graces newspaper headlines and politician’s speeches with increasing regularity. In the middle of party conference season, here’s a 10-chart guide to where the concern is coming from and what those seeking to address the challenge should be focusing on. 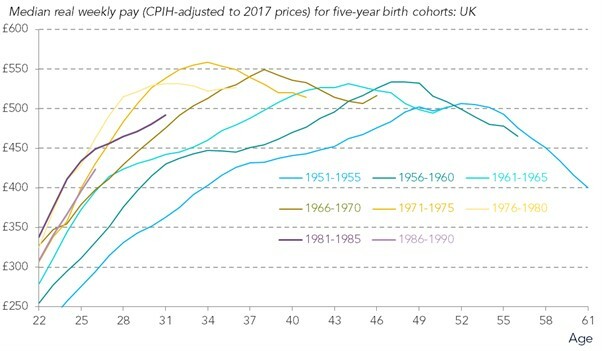 Young people were hit hardest by the recent pay squeeze, but the pay slowdown for young people pre-dated the crash. As a result, decades of progress on pay has come to a halt. Millennials born in the late 1980s were earning no more in their late 20s than those born in the early 1970s did at their age. One of the key routes to securing a big pay rise is moving jobs, particularly at the start of your career. 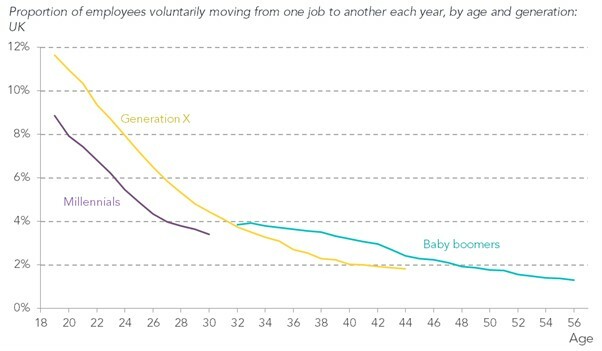 But despite their reputation for being footloose job-hoppers, millennials are actually moving jobs less frequently than previous generations did – and are losing out on big pay rises as a result. 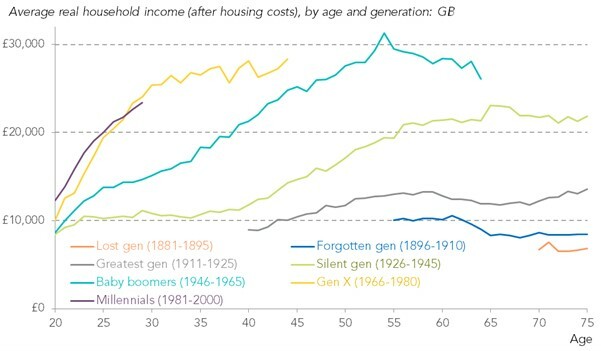 The cost of housing has been rising for the last six decades, with successive generations paying ever more for their housing at each age. As a result, young people today are on average spending almost a quarter of their income on housing. That’s three times as much as the pre-war generation spent at their age. The return on this record housing spending is pretty poor. 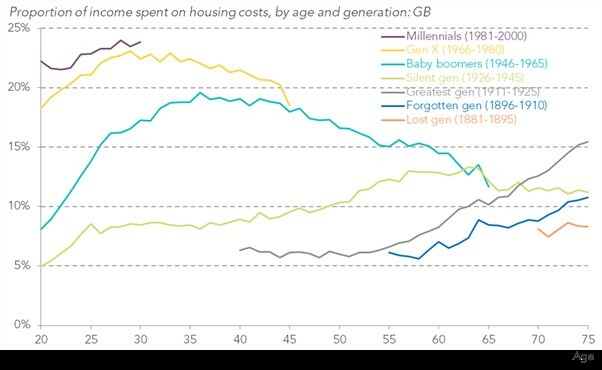 Millennials are half as likely to own a home by the age of 30 as the baby boomers, and are four times more likely to be living in the insecure private rented sector. Quality is deteriorating too: overcrowding is on the rise, commuting times are increasing and the average size of rented accommodation is falling. 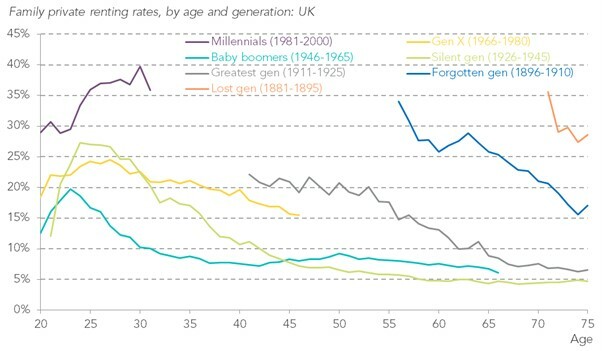 Taking the trends on earnings, employment, taxes, state support and housing costs together, millennials who have so far turned 30 have failed to improve on the living standards of generation X before them. That’s an unprecedented break from the generational progress we became used to during the 20th Century. It’s not just that millennials are earning less, they are spending less too. 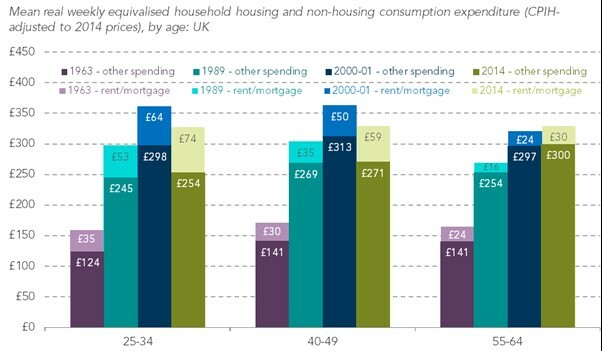 25-34 year olds now spend 15 per cent less on average than 55-64 year olds on non-housing items, whereas in 2000 the two groups spent the same amount. This spending squeeze puts paid to the idea that technological improvements or their frivolity and short-termism mean younger generations are spending like no tomorrow. And it’s not just their current standard of living we need to be concerned about. Millennials area also building up much less wealth – which is crucial to long-term living standards and security in retirement – than their predecessors had when they were the same age. 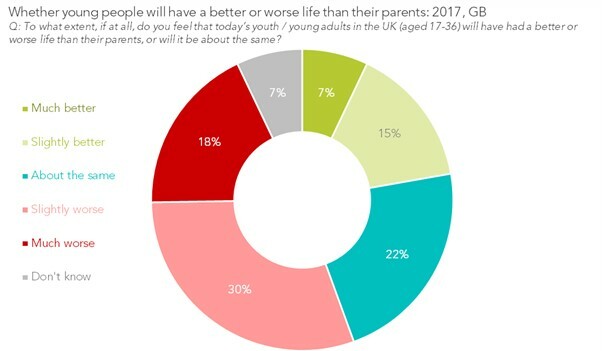 …And yet only a minority of people believe that this generational progress is still taking place for young people today. The pessimists currently outnumber the optimists by 2:1 – a staggering turnaround from as a recently as 2003, when the optimists outnumbered the pessimists by 4:1. 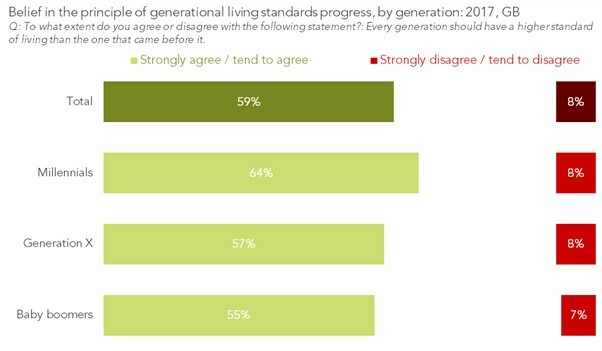 Housing, jobs and living standards in later life lie at the heart of this pessimism about generational progress. 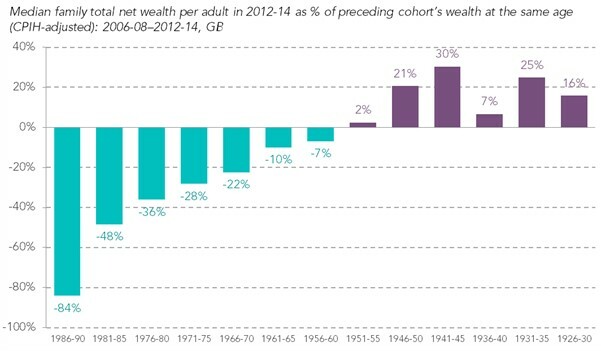 These concerns point to the kind of solutions needed to repair Britain’s fraying social contract between generations. That’s what our Intergenerational Commission is exploring, and what all political parties need to respond to.